ATLAS is an international collaboration of scientists who built a particle detector that is now probing nature at the TeV energy scale, or, equivalently, at the 0.0000000000000000001 m scale. ATLAS is currently studying proton collisions at a center of mass energy of 8 TeV provided by the Large Hadron Collider, LHC, at the European Laboratory for Particle Physics, CERN. The particle physics group at the University of Victoria has been an active member of the ATLAS Collaboration since its inception in 1992. High Energy Particle Physics is the study of the fundamental forces of nature which govern the interactions between radiation and the ultimate constituents of matter. This study is, arguably, the most fundamental amongst all the physical sciences and hence draws much interest. The distance scale at which an experiment is able to probe nature is related to the de Broglie wavelength h/p of the probing particle of momentum p , where the universal Planck constant h plays a pivotal role. Experiments of higher energy, and ironically of larger size, are then usually required to probe smaller scales of matter, and to recreate, momentarily, the conditions that prevailed close in time to the beginning of the Universe. The laws of nature are governed by four fundamental interactions: the strong, the electromagnetic, the weak, and the gravitational interactions. For masses at the atomic and subatomic scale, the gravitational interaction is extremely small and can be ignored. The other three interactions are described by the Standard Model. The electromagnetic and weak interactions have been unified and the resultant electroweak interaction is described by the Glashow-Salam-Weinberg (GSW) model. The theory of strong interactions is described by Quantum Chromodynamics (QCD). Together the GSW model and QCD form the Standard Model. These interactions are transmitted by specific fields or particles which are equivalent concepts in relativistic quantum field theory. It now appears that the strong forces are transmitted by massless spin 1 gluons, while the weak forces are transmitted by massive spin 1 W and Z bosons discovered at CERN by the UA1 and UA2 experiments. Despite the Standard Model's spectacular success it fails to provide answers to a number of fundamental questions, the most obvious ones concerning the origin of the values of particle mass, the number of quark and lepton families, the origin of the charged weak current mixing angles, and the origin of CP violation. What lies beyond the Standard Model? Is supersymmetry realised in nature? The Large Hadron Collider is now in operation and is CERN's most advanced accelerator. This 27 km accelerator, coupled to the existing CERN complex, will soon provide high luminosity proton-proton collisions at a centre of mass energy of 14 TeV. This will allow physicists, for the first time, to probe the laws of nature at the TeV scale, revealing, it is expected, clues of the origins of mass and evidence for new symmetries and new forces in nature. The LHC has produced 2.36 TeV proton-proton collisions on December 7th 2009, an energy world record. It is operating at 7 TeV proton-proton collisions since March 30th 2010. 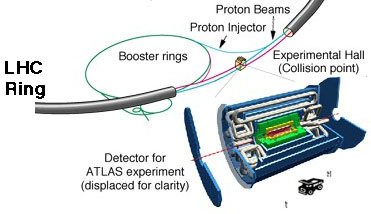 ATLAS is one of two multipurpose detectors designed to harvest the physics discovery potential of the LHC by reconstructing the products of the proton-proton collision event by event. The design, construction and commissioning of the ATLAS detector is an enourmous challenge, and components were developed and constructed around the world. The detector assembly is now completed in the ATLAS cavern, 100 m under the ground, and is currently successfully recording the first LHC collisions. The ATLAS collaboration's effort started in 1992. Over 3000 physicists from 37 countries are members of ATLAS. Canada is investing important human and monetary resources into ATLAS and the LHC. Canada has been part of the ATLAS effort from its inception. The ATLAS-Canada collaboration now involves over 150 scientists, technicians an engineers, including 41 grant eligible physicists from institutions across Canada. Canada's contribution to ATLAS focuses on liquid argon calorimetry, a crucial part of the ATLAS detector, which allows the measurement of the energy of most particles produced in a collision. The related hardware projects were funded by Major Installation Grants from the Natural Sciences and Engineering Research Council of Canada, NSERC , with continued support from TRIUMF, Canada's National Laboratory for Particle and Nuclear Physics .